If analyzing nitrided hafnium oxide or silicate, collect entire Hf4p region (up to 490eV), making sure both Hf4p3/2 and Hf4p1/2 components are acquired. This will give the best opportunity to deconvolve the true N1s signal from the overlapping plasmon loss feature of the Hf4p1/2 peak. The weak Hf4s directly overlaps the O1s region. The plasmon loss feature from the Hf4p1/2 peaks directly overlaps the N1s region. Caution must be used when peak fitting the N1s region in nitride hafnium oxide/silicate samples. Hf4f region has well separated spin-orbit components (Δ=1.68 eV). Loss feature for Hf metal appears at 30eV and 23.5eV for HfO2. Peaks in the Hf4f region have an asymmetric peak shape for hafnium metal. 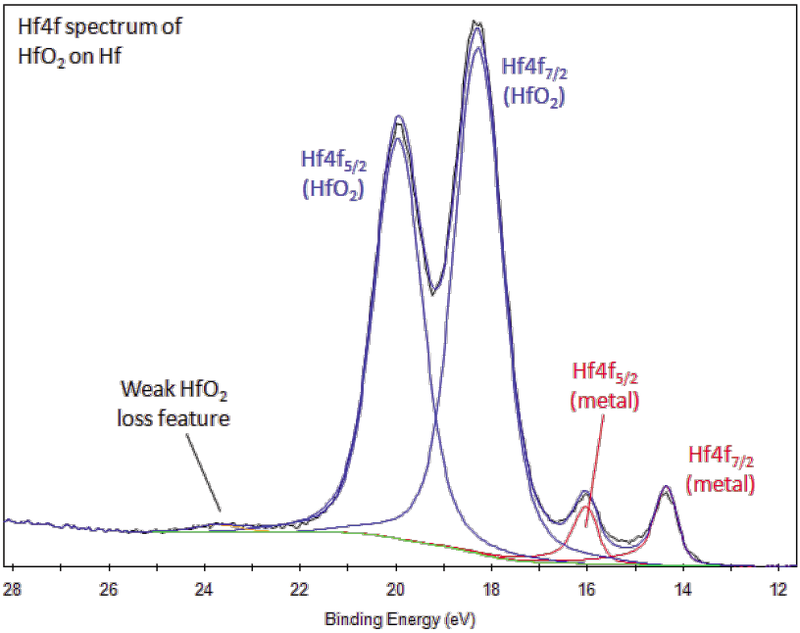 Hafnium compounds, such as the oxide, have symmetric Hf4f peaks. Hafnium oxide is reduced by an argon ion beam to form a continuum of oxidation states. Use lowest beam energy possible for profiling or cluster source to clean top surface. While using X-ray spectroscopy to study the arrangements of the outer electrons within atoms in samples of zirconium ore, D. Coster and G. von Hevesy discovered the element hafnium and were also able to predict the electron structure of the element. Hafnium, a lustrous, silverish gray tetravalent transition metal, has many characteristics similar to that of zirconium. Half of all hafnium metal produced is through a by-product of zirconium refinement. 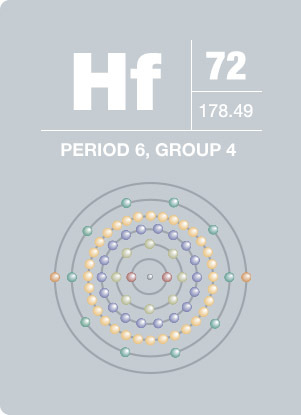 While found in natural zirconium compounds, hafnium does not exist as a free element in nature. Because hafnium is a good absorber of neutrons, has superb mechanical and corrosion resistance properties, it is used to make nuclear control rods, such as those used in nuclear submarines.